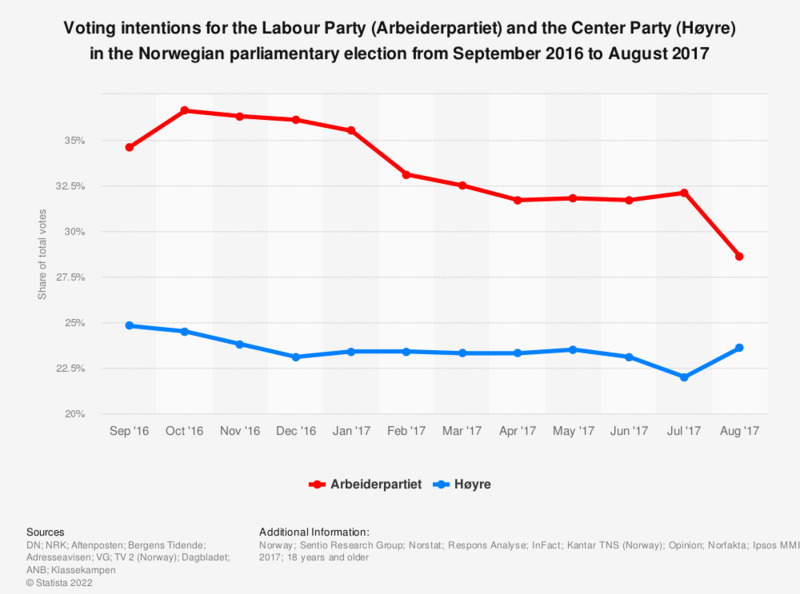 The statistic shows the average results of surveys conducted monthly from September 2016 to August 2017 in Norway on the current voting intentions for the Labour Party (Arbeiderpartiet) and the Center Party (Høyre) in the Norwegian parliamentary election, set to held on September 11, 2017. A selection of Norwegian voters were asked to give their vote as if the elections were taking place today. Shown here is the average for the results of each months for the Labour Party and for the Center Party. According to the latest survey conducted in August 2017, the social-democratic Labour Party would have received 28.6 percent of the total votes. The conservative Center Party would have received 23.6 percent. Elections of the Norwegian Parliament (Storting) are held every four years. Surveyed respondents were asked to give their vote as if the Norwegian Parliament elections were taking place today. The number of survey participants for the individual months is not provided by the source.